Prime Minister David Cameron’s plan to ban encrypted messages has come under fierce criticism, as UK and US intelligence agencies announce plans to stage transatlantic cyber “war games” to test their resilience against cyber-attacks. Current affairs magazine The Spectator argues that Britain could end up like China and Russia, where encrypted communications are already banned. Cameron plans to ban encrypted messaging apps such as Whatsapp and Snapchat, if he retains his post as prime minister after May’s general election. He says the government should be able to monitor such messages to detect possible terrorist communications. However, tech firms argue that with an increasing number of global hack attacks, internet users need encryption now more than ever. US President Barack Obama has announced his own cyber-security proposals. Earlier this week he tabled a cyber-security legislative proposal for companies to share data with the US government. The UK and US governments say they will stage a simulated targeted cyber-attack on banks in the City of London and Wall Street later this year. The “war game” against the financial sector will be coordinated by a US and UK “cyber-cell.” GCHQ and MI5 agents from Britain, together with the National Security Agency and the FBI in the US, are already reportedly working in the US division of the cell. 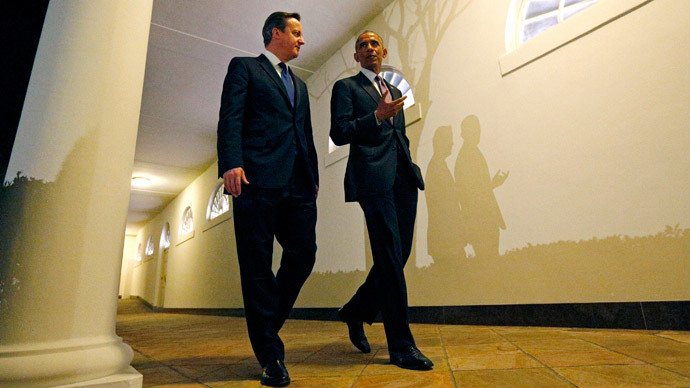 Cameron is currently in Washington, holding talks with Obama. The PM defended his plans to set up a new legal framework to tap into communications. “The principle we should adopt is that there shouldn’t be a safe space for terrorists to communicate,” Cameron said. The PM called for an updated legal framework on communications.